Samsung’s really going for it on the Galaxy front this year. The Korean tech giant has already launched the Galaxy S9, Galaxy S9 Plus and Galaxy A8. The Galaxy J6 is coming soon. And here’s another one that’s worth checking out - the Galaxy A6. As you’ll see below, it’s an impressive feature-packed phone. But first of all, let’s tackle the big question - where exactly does it fit in with the other Galaxys? The answer is… right between the Galaxy A8 and Galaxy J6. Here’s why - the Galaxy A8 is a mid-range to premium handset, and the Galaxy A6 and Galaxy J6 are solid mid-rangers. Both are great phones, but the A6 has slightly better specs. For example, it’s got a metal (rather than plastic) body, and a superior camera set-up. Samsung knows how to make an attractive phone, so no surprises here - the Galaxy A6 looks fantastic. With a super-slim aluminium unibody and smooth curves, it’s got a real touch of class to it. It also feels solid as a rock, thanks to a combination of its metal design and tough Corning Gorilla Glass protection. The 5.6-inch Infinity Display on the Galaxy A6 is stunning, especially when you consider that this is a mid-range device. With virtually no bezels, the screen extends right to the edges of the phone. Plus, it’s Super AMOLED - so you’re guaranteed deep blacks and rich, vivid colours. It’s also worth mentioning the 18.5:9 aspect ratio. 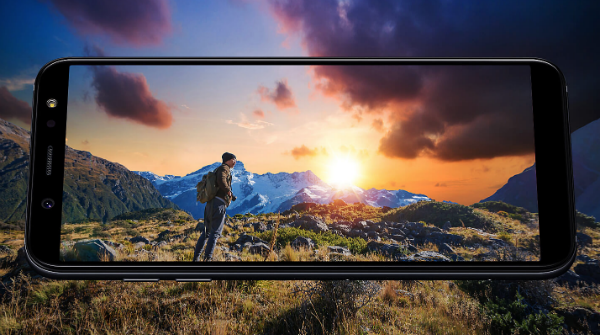 This is the new trend in smartphone screens, and it gives you an extra wide display for a full-on cinematic viewing experience. Round the front, you’ll find the same 16MP camera as the Galaxy A8, and it’s a cracker. It instantly brings faces right into focus when you hold the phone at arm’s length, and it comes with three flash settings to give your selfies more clarity, day and night. 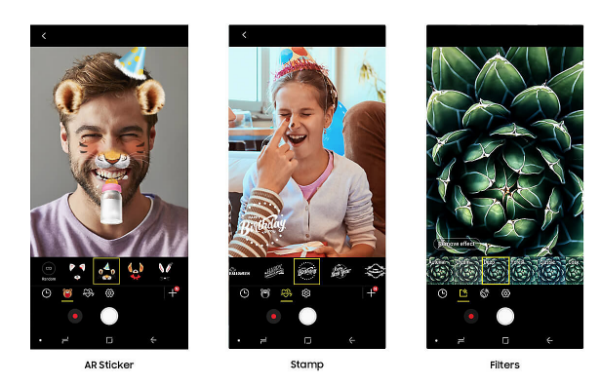 And if all that wasn’t enough, the camera app has lots of fun stickers and filters to give your photos a touch of creative flair. The Galaxy A6 has 32GB of inbuilt storage space. That’s a decent amount, but if you want more space it’s easy enough to slot in a microSD card and add up to a whopping 256GB. Battery life is impressive. The 3,000mAh cell easily lasts well over a day before it needs to be recharged again. And with face recognition and an inbuilt fingerprint scanner, you’ll be able to instantly access the phone without having to worry about inputting passcodes or swipe patterns. The Galaxy A6 is a mid-range phone that really punches above its weight. From that gorgeous Infinity Display to the superior selfie-camera, it gives you an amazing performance. If you’re interested in making it your next phone, it’ll be available from Carphone Warehouse shortly - so keep an eye out for it.